This symposium examines Romanticism as a shape-shifting cultural phenomenon that resists easy categorization. Focusing on the period from 1760 to 1860, the symposium embraces the amorphousness that has been ascribed to Romanticism historically by eschewing any limiting definition of it, seeking instead to explore the broad range of art and visual culture characterized as “Romantic” during this hundred-year span. We are interested in what the Romantic “eye” pursued and perceived, and how it set itself the task of recording those perceptions. In addition to interrogations of the relationship between the visual arts and Romanticism, we welcome papers on writers, composers, scientists, and philosophers whose projects engaged the visual. Papers also are sought for a special panel that will address the legacies of Romanticism in contemporary art. This symposium coincides with a major collaborative exhibition organized by the Yale Center for British Art and the Yale University Art Gallery, The Critique of Reason: Romantic Art, 1760–1860, which opens March 6, 2015. 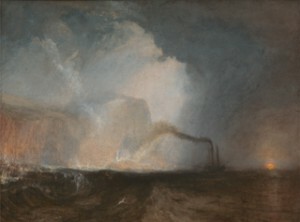 The exhibition comprises more than three hundred paintings, sculptures, medals, watercolors, drawings, prints, and photographs by such iconic artists as William Blake, John Constable, Honoré Daumier, David d’Angers, Eugène Delacroix, Henry Fuseli, Théodore Géricault, Francisco de Goya, John Martin, and J. M. W. Turner. Talks that respond explicitly to works in the collections of the Yale Center for British Art or the Yale University Art Gallery are particularly encouraged, as are cross-disciplinary and comparative studies. We are seeking presentations of thirty minutes in length. Graduate students and early career scholars are particularly encouraged to apply. Travel and accommodation costs will be covered by the organizers. Please e-mail abstracts of no more than three hundred words and a short CV or bio (no more than two pages) by February 2, 2015, to romanticism2015@gmail.com. The symposium is cosponsored by the Department of the History of Art at Yale University, the Yale Center for British Art, the Yale University Art Gallery, and the Yale Student Colloquia Fund. Places are FREE but limited to 15 in total, excluding speakers and organisers. This is due to restricted access to the Print Room. To secure your place, please email Mary.Shannon@roehampton.ac.uk, providing your name, status/job title, and institution (for name badges). Places will be awarded on a first-come, first-served basis and you will receive email notification. However, there will also be a waiting list. If you are unable to take up your place, please NOTIFY US BY EMAIL IN GOOD TIME so that someone else on the list may be offered your place. We are able to offer 2 postgraduate ‘Bibliographical Society Studentships’ of £60 each to assist with the cost of attending at the symposium. Postgraduate students who live outside London are eligible. To apply, please send a CV and a statement (200 words) to Mary.Shannon@roehampton.ac.uk by Friday 6th February explaining your current research and its relevance to the interests of the Romantic Illustration Network as well as to the aims of the Bibliographical Society. Successful applicants will be notified by Tuesday 10th February. Subject to permissions, we are hoping to record proceedings for the benefit of those unable to attend. 5pm Close. Please join us for a drink nearby. the digital world of the 21st century? panelists must be members of both SHARP and SAMLA in order to present. Image of the Month: Mutual undermining by “Boz” and Cruikshank? Mutual undermining by “Boz” and Cruikshank? Mary L. Shannon’s paper, at the recent The Artist and the Writer RIN symposium, discussed how Dickens, in the guise of “Boz”, had used Cruikshank’s established visual persona to bolster his own. This led me to think about another “Boz” – Cruikshank relationship from August 1838 in Bentley’s Miscellany, where they had engaged in some mutual under-mining. The sketch in question was the ‘Full Report of the Second Meeting of the Mudfog Association for the Advancement of Everything’ which was ‘illustrated by George Cruikshank’. Within this article is a discussion on the local beadle. “Boz” was given the chance to state his case first. Mr Sowster, the reader is informed, was a ‘fat man, with a more enlarged development of that peculiar conformation of countenance which is vulgarly termed a double chin.’ After some ‘unconstitutional proceedings’ in which Mr Sowster was employed as a bouncer for the Mudfog meeting, “Boz” announced that he had ‘procured a local artist to make a faithful sketch of the tyrant Sowster’. This likeness was ‘from the life, and complete in every respect. Even if I had been totally ignorant of the man’s real character, and had it been placed before me without remark, I should have shuddered involuntarily. There is an intense malignity of expression in the features, and a baleful ferocity of purpose in the ruffian’s eye, which appals and sickens. His whole air is rampant with cruelty, nor is the stomach less characteristic of his demoniac propensities.’ Such a description evokes terror, potentially comic, especially when considering the satirical trope of beadles. 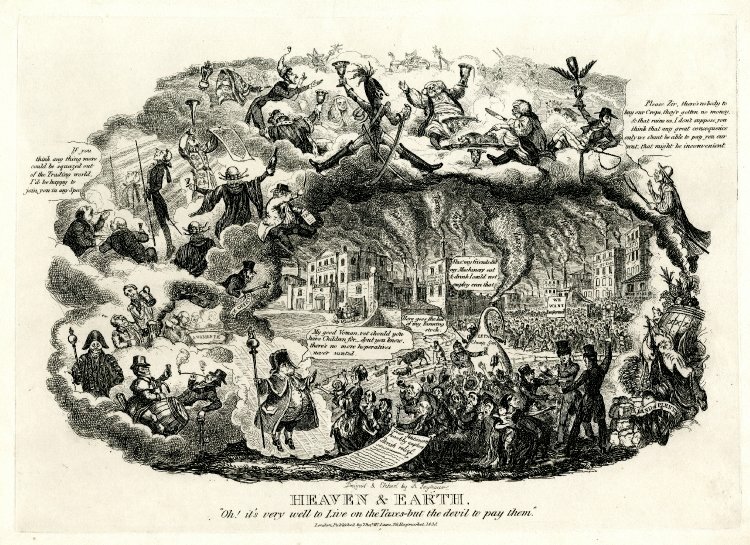 As noted by Sally Ledger, one of the prototypes for Mr Bumble, the beadle in Oliver Twist (1837-1838), was Robert Seymour’s 1830 engraving ‘Heaven and Earth’ in which a beadle, in a cocked hat, flowing robes and staff, descends from the clouds to deny relief to starving paupers (Figure 1: bottom centre). 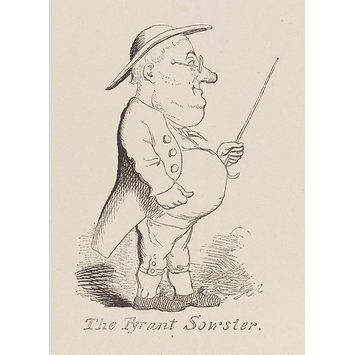 In Figure 2, Cruikshank has depicted Sowster as a benignly comic figure, all double-chin and belly with little arms and legs attached, rather than the ferocious tyrant per “Boz’s” description or the pompous petty official of the satirical stereotype. So who is right? Is the ‘local artist’ incapable of accurate sketching or has “Boz” been carried away by his rhetoric? Dickens, Charles; ‘The Second Report of the Mudfog Association for the Advancement of Everything’; Bentley’s Miscellany; 4; (August 1838); 209-227. Ledger, Sally; ‘From Queen Caroline to Lady Deadlock: Dickens and the Popular Radical Imagination’; Victorian Literature and Culture; 32; (2004); 575-600. Members of the Illustration Network might be interested in the upcoming events associated with the Blake exhibition at the Ashmolean.